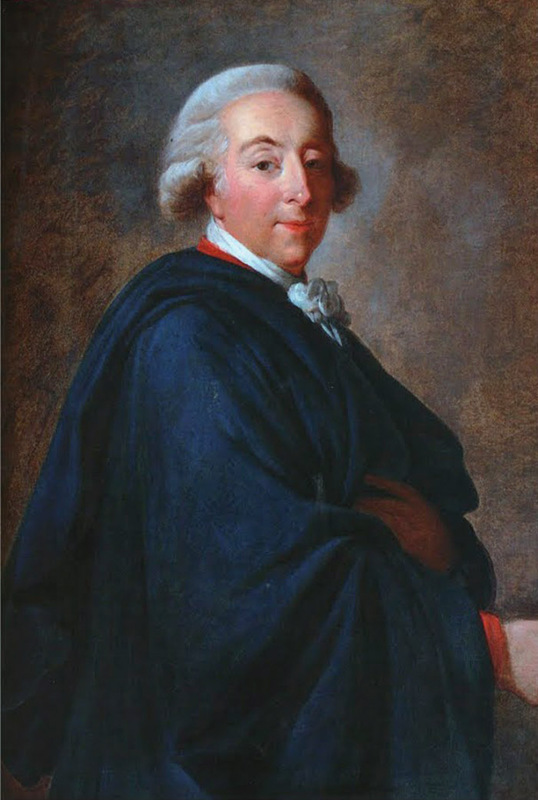 Louis-Philippe d'Orléans (1725-1785) , known as "le Gros" (the fat one), the father of Philippe-Egalité and the grandfather of Louis-Philippe, married his mistress Madame de Montesson in 1773 after he lost his wife. 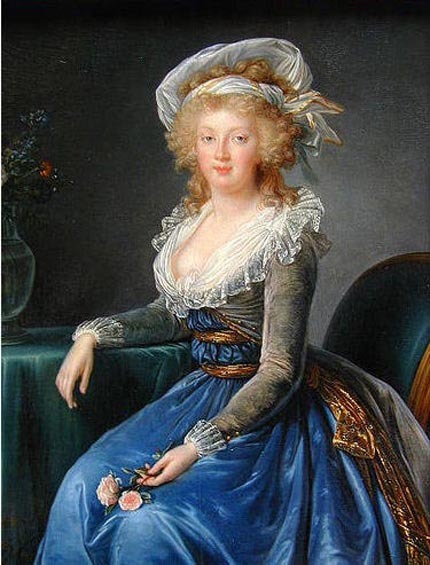 But this marriage, finally authorized by Louis XV, remained morganatic and secret since his new wife could not assume the title of Duchess of Orleans. Bio and sale information from The Art Tribune. View a different version of this portrait on Page 105. Note the additional medals. Listed in Neil Jeffares Dictionary of pastellists before 1800. 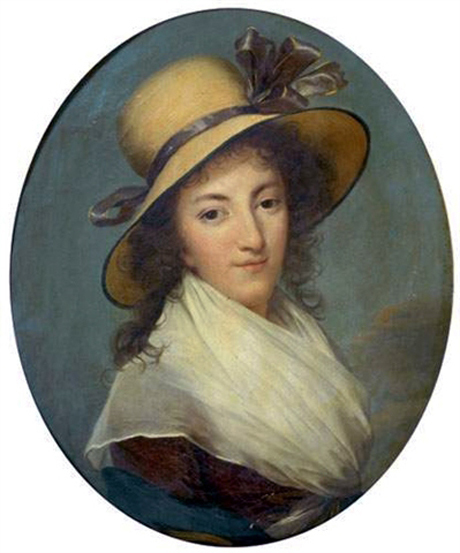 Jeanne Beraud de La Haye, Marquise de Montesson (1738-1806) lived in a mansion on Chaussee d Antin street from 1785. She married the duke of Orleans the father of Philippe duc de Chartres. Mme de Montesson spent time in chateau du Raincy, near Paris. Sale information from The Art Tribune. Listed in Neil Jeffares Dictionary of pastellists before 1800. 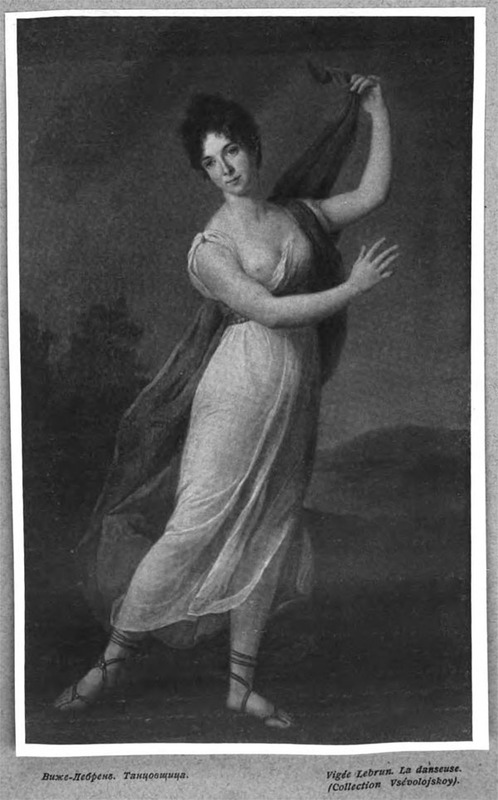 View additional images of Mme Montesson on Page 159, Page 51 and Page 168 . 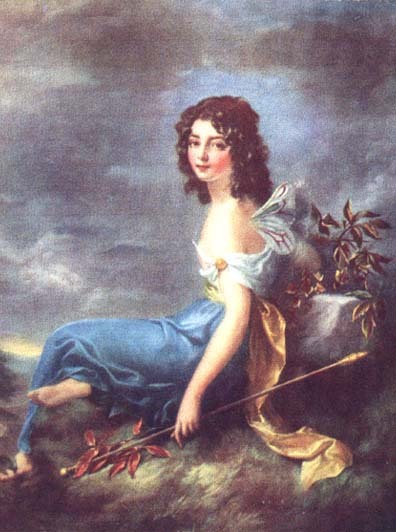 Born Jane Wilson (1769-1844), she and her older sister Margaretta were courted by the Perceval brothers. 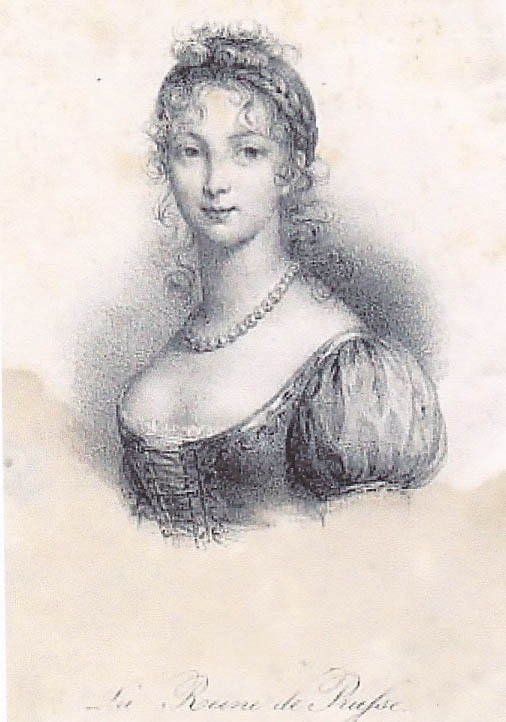 Their father approved Margaretta's marriage to Charles Perceval (Lord Arden), a wealthy Member of Parliament and Lord of the Admiralty, but disapproved of the match between Jane and Spencer Perceval, who was a modest barrister. The couple eloped, and by the time Vigée Le Brun met them, Spencer Percival had himself become a Member of Parliament and had been selected Attorney General.He would later rise to become Prime Minister, 1809-12, being assassinated in office. In 1815, Jane married Lieutenant-Colonel Sir Henry Carr, who died in 1821. (Bio from Charles Stein's annotated painting list). 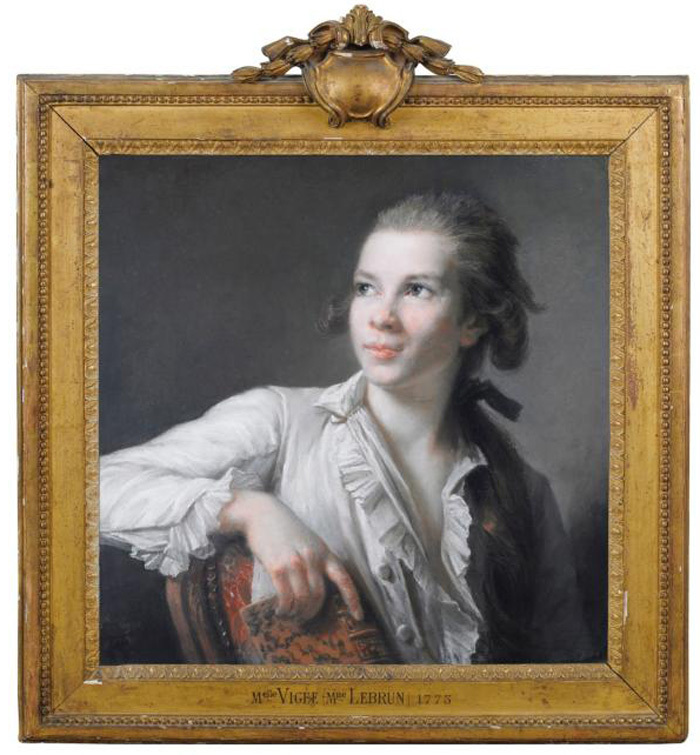 The portrait was sold by Sotheby's, Paris on March 25, 2014. 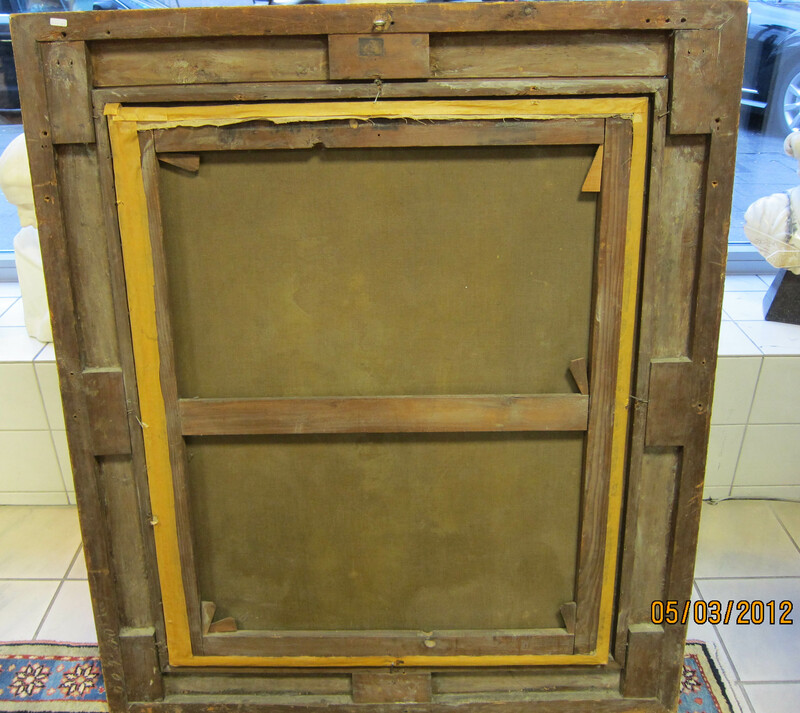 It is part of the Vicomtesse de Courval Collection. 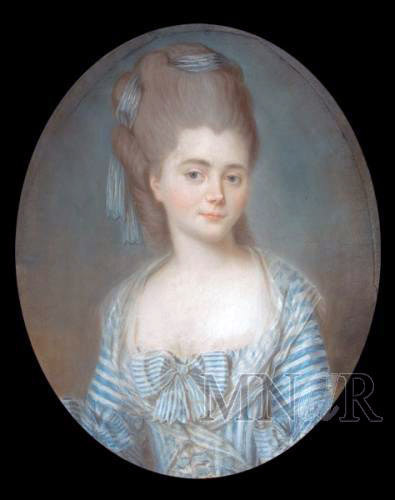 Marie Christine Lichnowska - 1785? 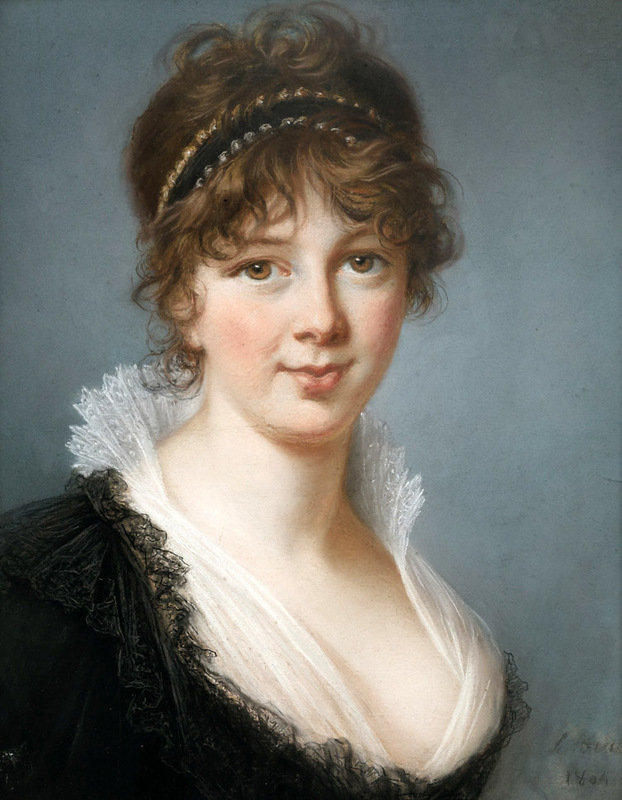 Marie Christine Countess Lichnowska, born Thun-Hohenstein (1765 - 1841). 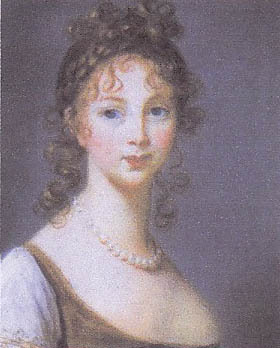 Maria Christiane Thun (1765-1841), who married Prince Karl Alois Lichnowsky (1761-1814) a friend of Ludwig van Beethoven. The sitter's father, count André Kyrillowitsch Razumovsky, was a big patron of Beethoven. 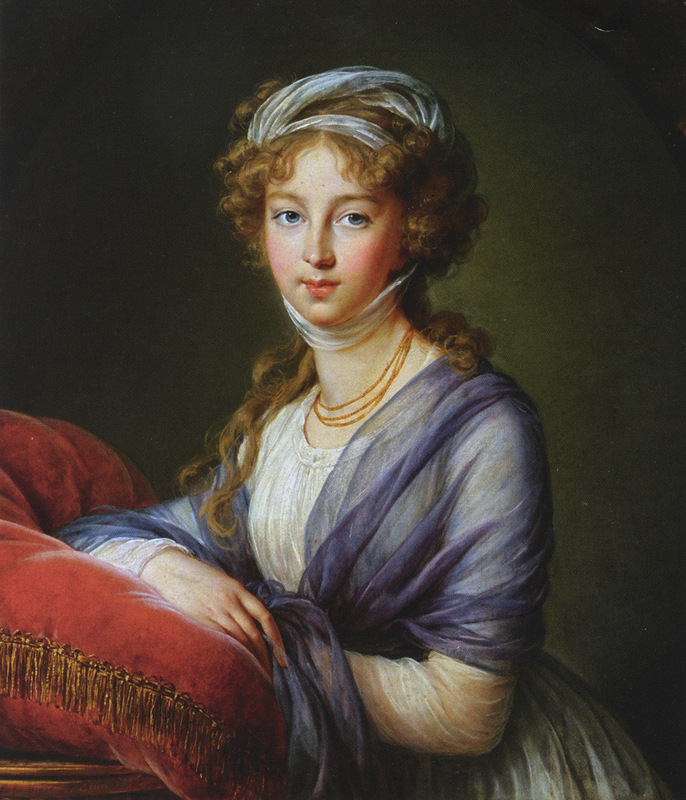 Vigée Le Brun also painted her sisters (Elizabeth Razomovskaya and Lady Guisford), and their mother, Countess Thun. 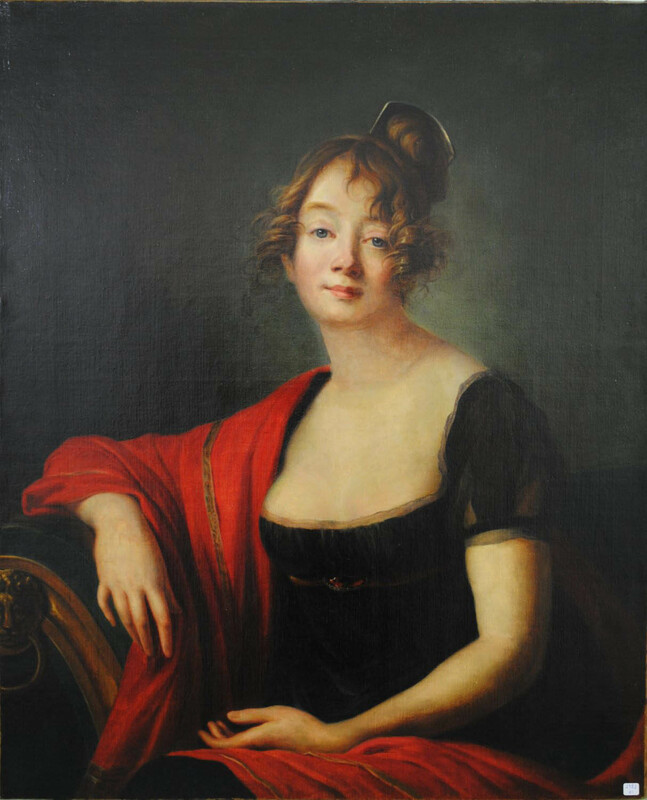 Listed by Vigée Le Brun as "1 Princess Linovska." View a pastel version of this portrait on Art Page 75. View the larger image of this portrait. 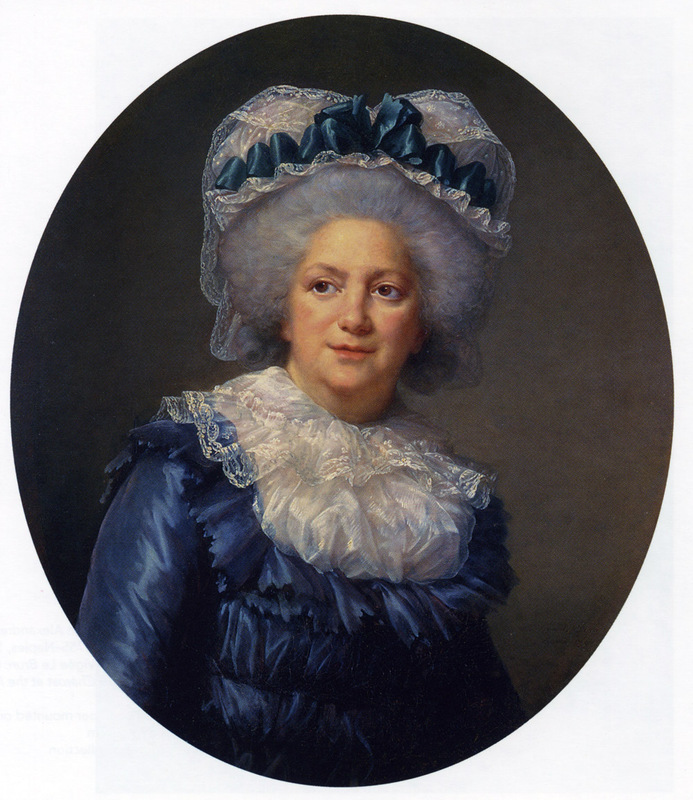 Pauline Francoise de Lamoignon de Malesherbes (1758 - 1827), married to Charles Philippe Simon de Montboissier. 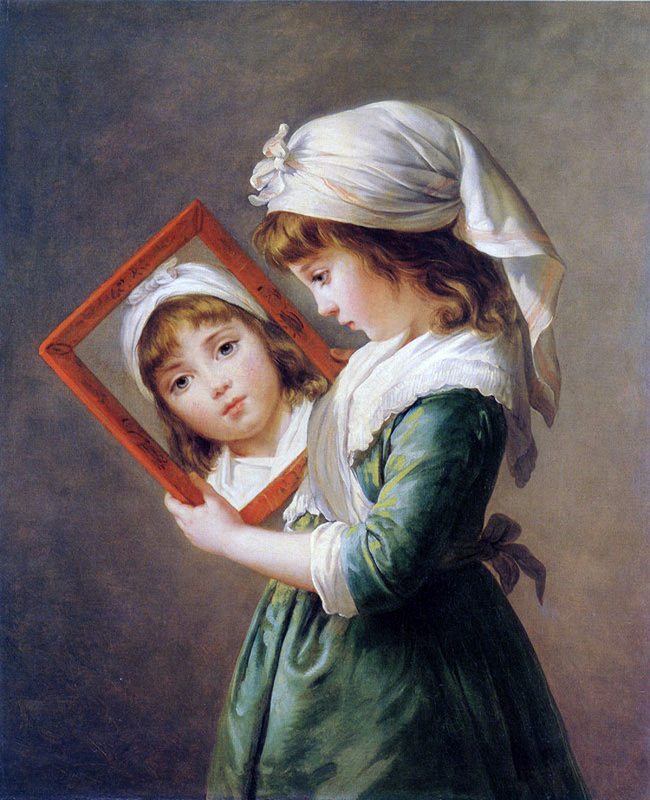 The inscription says: "Painting by Mlle Vigée, 1776". 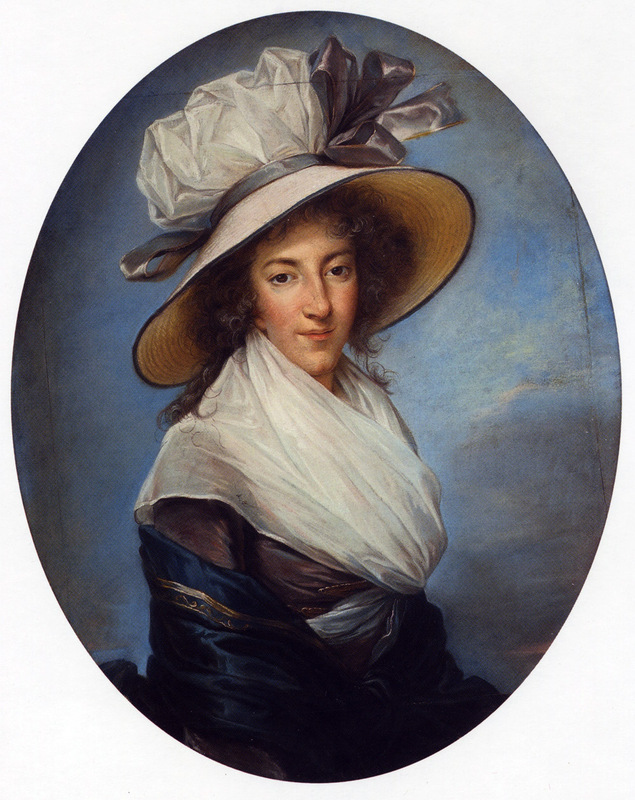 Alexandrine Charlotte Sophie de Rohan Chabot, Duchesse de La Rochefoucauld (and later Marquise de Castellane). Lived 1763-1839. View another slightly different copy of this painting on Art Page 121. Eugénie Tripier Le Franc - ? Another different version of Julie with a mirror. Reference Kimbell Exhibition Catalog Number 25 for more details on the two versions of this portrait. The book, "The Wrightsman Pictures (Pg 248), provides more background. Mme. 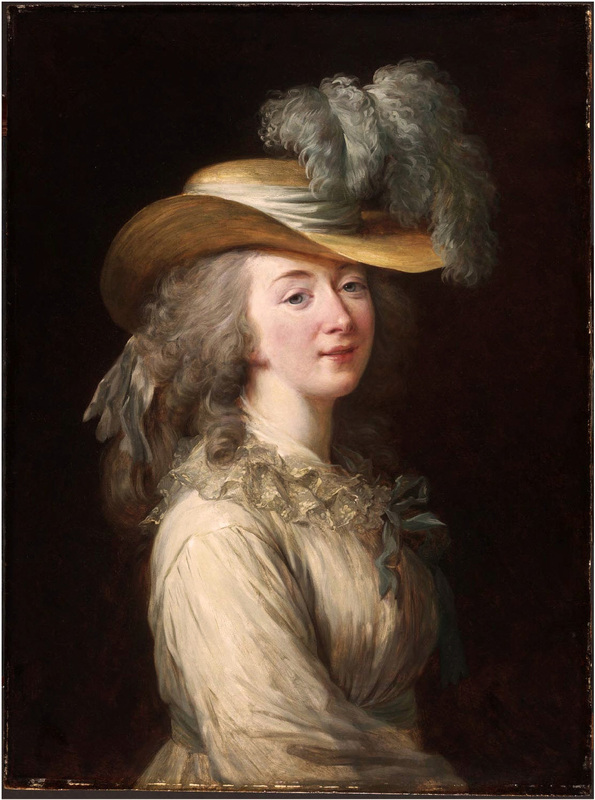 de Polignac (1749-1793), the wife of the influential Armand Jules Francois Duke de Polignac (1745-1817), was the intimate friend of Marie Antoinette and had charge of the royal children. 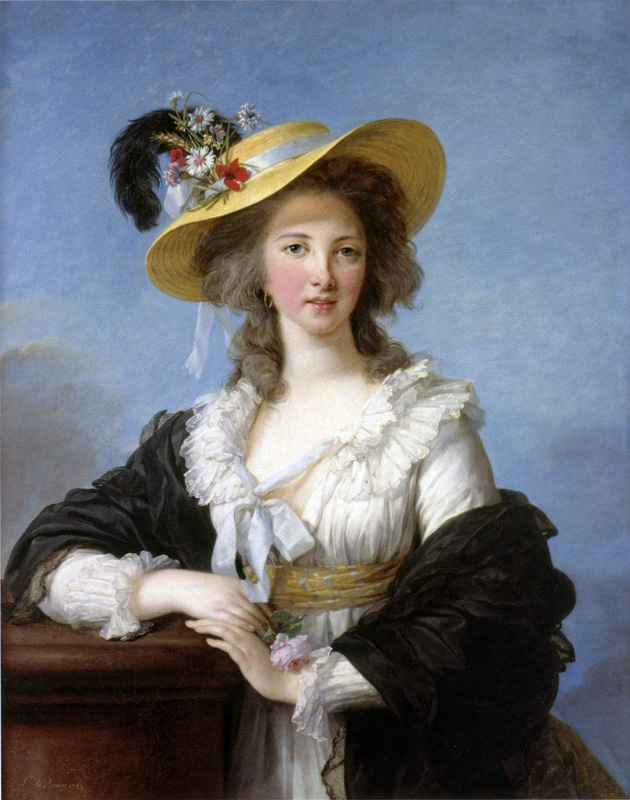 She was notorious for her extravagance, and was the mistress of the Comte de Vaudreuil. 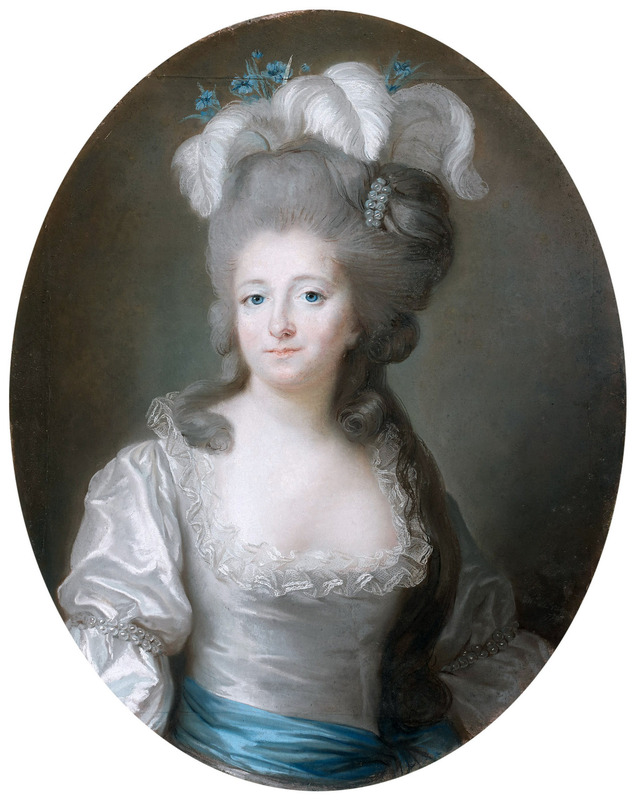 After the fall of the Bastille she was persuaded by Marie Antoinette to flee the country, and died in Vienna, Dec 5, 1793, at the age of 44. 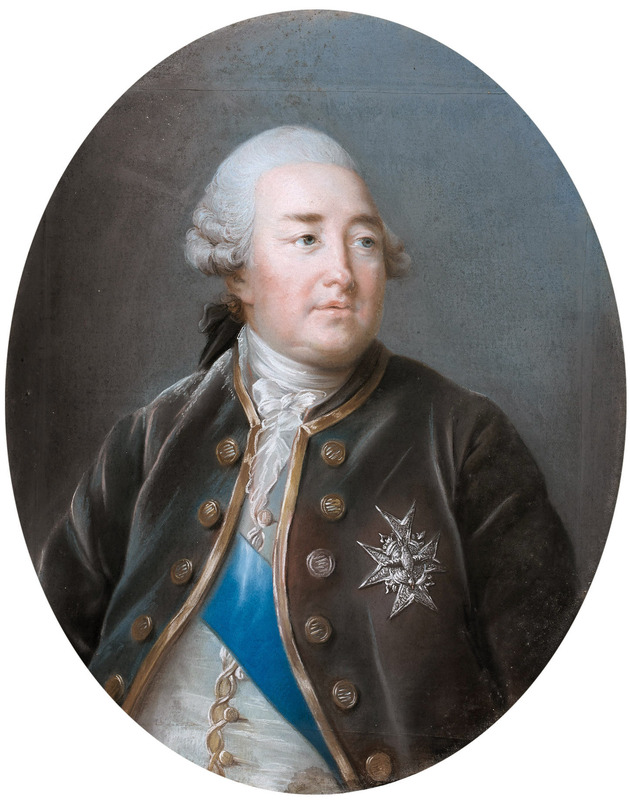 Her son, the Prince de Polignac, was later French Ambassador at St. James's. View another version of this painting that appears in the Wadsworth Atheneum, Hartford, Connecticut. See (Art Page 54). View additional information on this portrait. Now located at Art Page 193. The portrait is located at the Ingestre Hall Residential Arts Centre in the Loire Valley of France. Sitter identification is unknown. Now located at Art Page 145. Princess Maria Theresa, later Empress of Austria. The Queen of Naples commissioned this portrait of her eldest daughter, Maria Theresa of Bourbon-Two Sicilies (1772-1807). She married her first cousin, Franz II , Emperor of Germany (1792-1806) and Austria (1806-35). 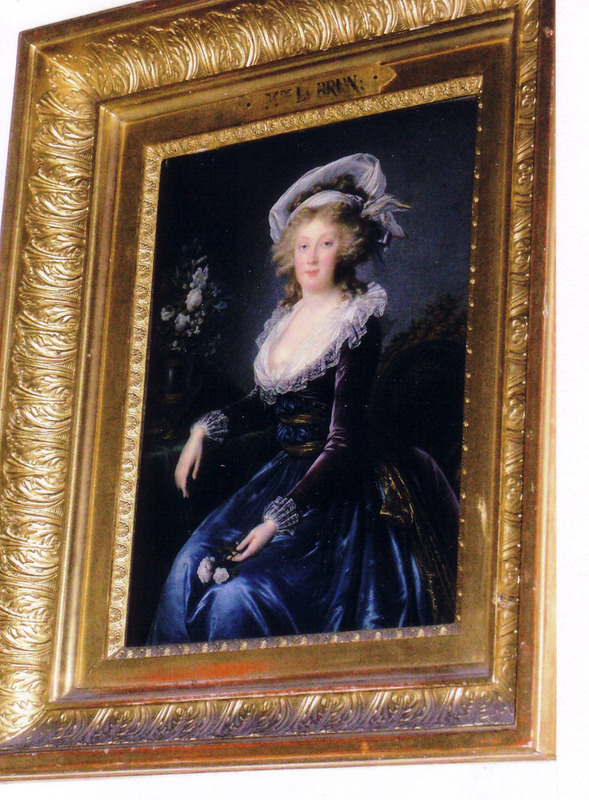 View another portrait of Maria at Conde Chantilly, France (Art Page 37). Now located at Art Page 155. 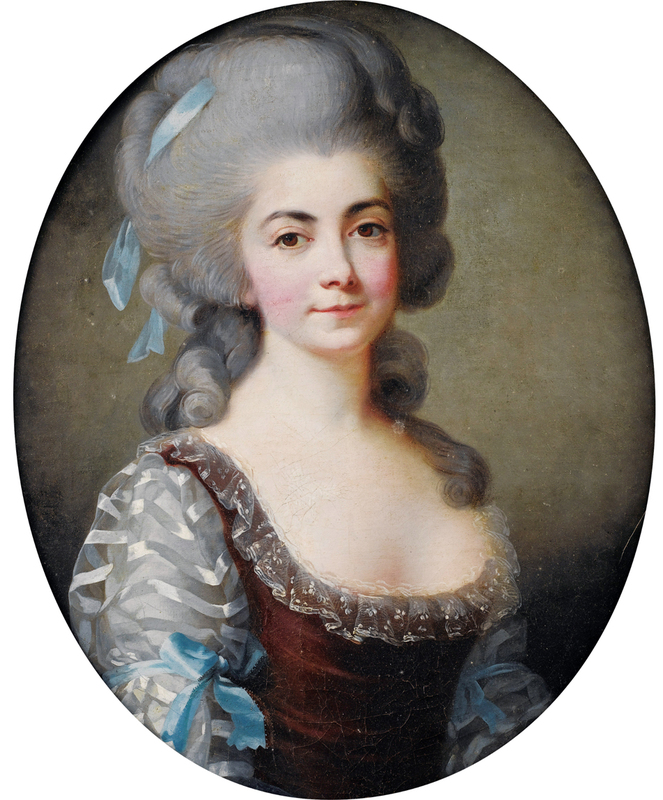 This pastel has been judged by Sothebys experts to be the work of Vigée Le Brun. 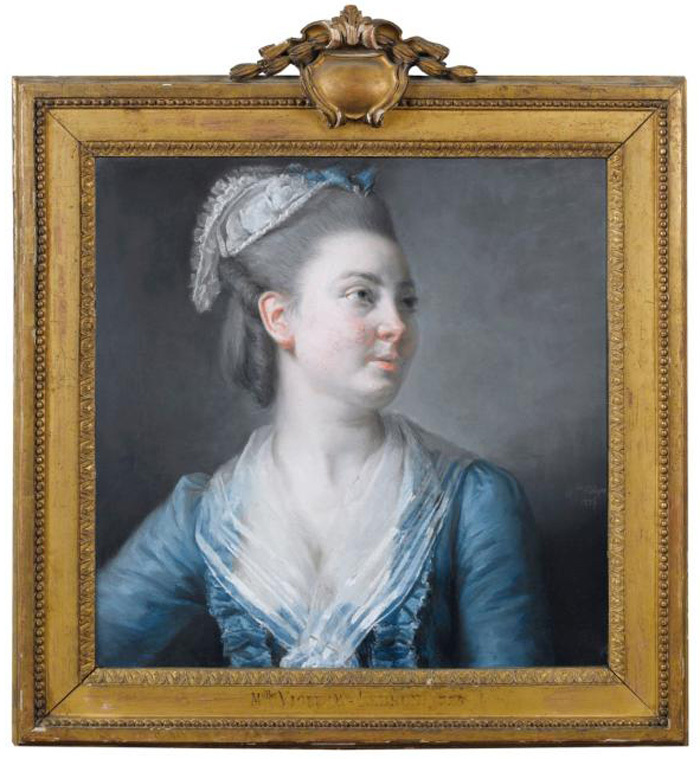 This pastel is listed in Neil Jeffares' Dictionary of Pastellists before 1800 (pg 10). 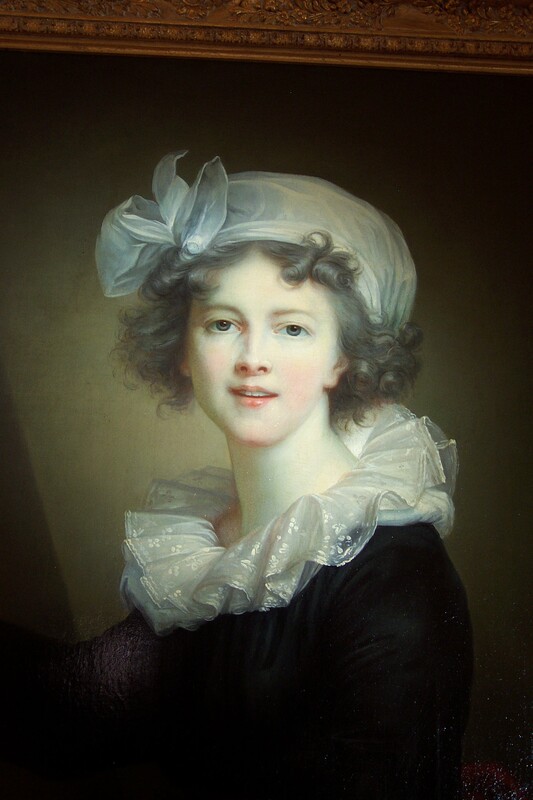 This Pastel is very similar to Vigée Le Brun's portraits of Countess Tankerville (1800) and Julie Le Brun (1799). Photo of the oval painting. 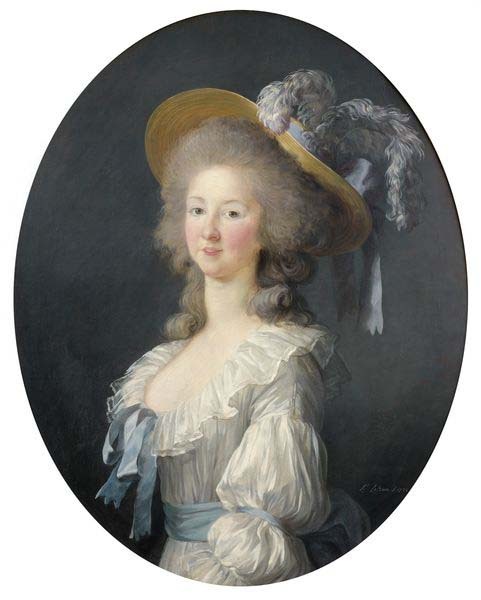 From Olivier "The clothes and hairstyle allow us to date it: obviously 1789. Maybe Mme de Savigny or Mme Duvernais ?". Oliver is researching the painting. oil on canvas, 30-3/4 x 24-3/4"
Grand Duchess Elisaveta Alexeevna, later Empress of Russia, consort of Alexander I. Pavlovitch. 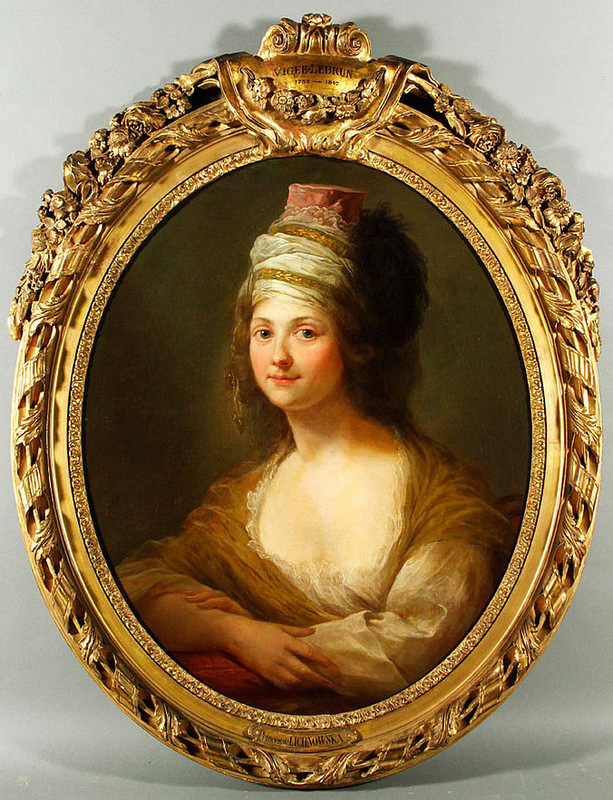 This original is in the Collection of the Princess of Hesse Darmstadt, Castle of Wolfsgarten. 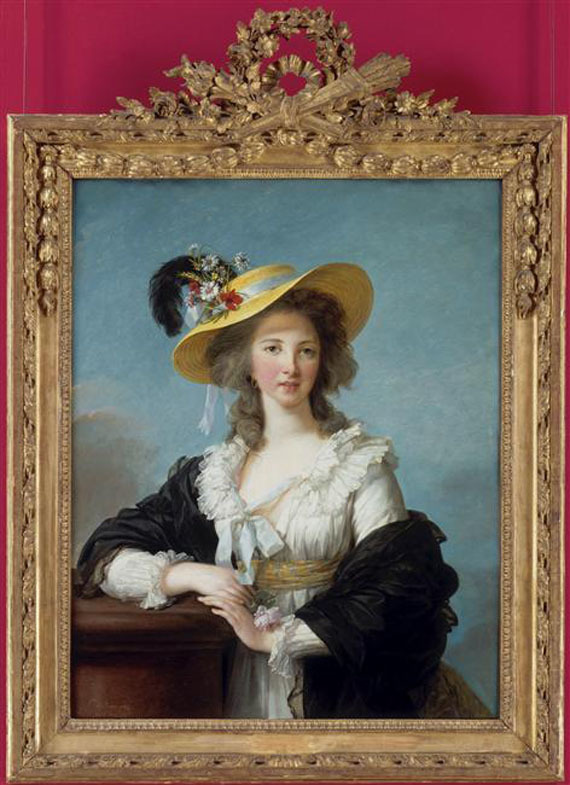 The portrait was a gift to the Grand Duchess's mother the Landgravine Amalie of Hesse-Darmstadt. One copy is in the Musée Fabre, Montpellier(Art Page 44) and another copy is in the Hermitage Museum, St Petersburg, Russia(Art Page 48). 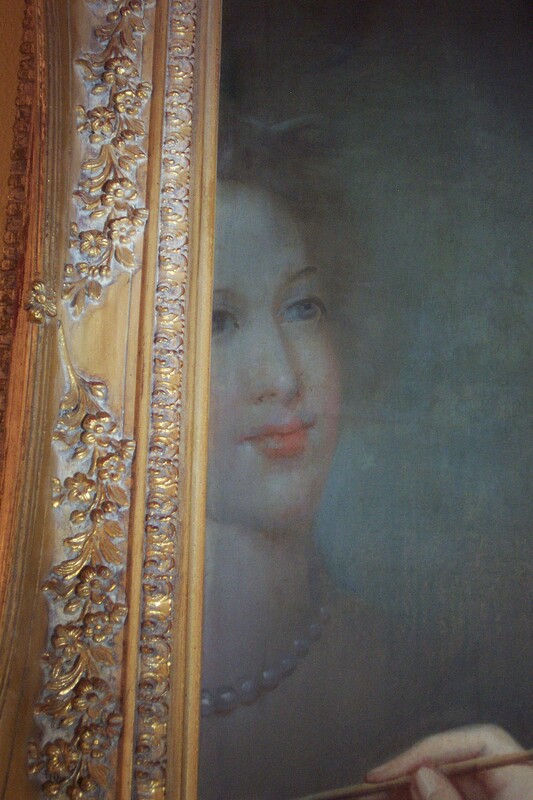 Thought to be the Princess Tufiakin portrait until May 2010. 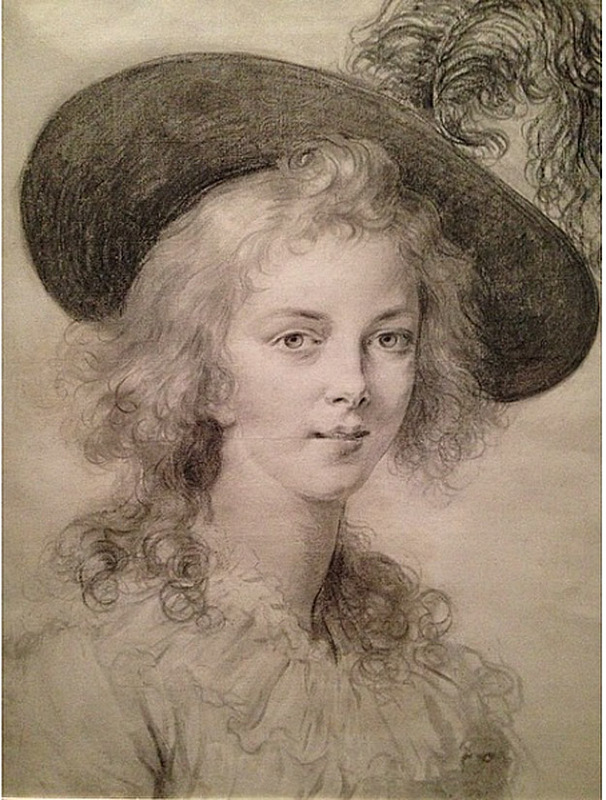 Francis Kelly identified the sitter, based on Vigee Le Brun's sad description in Chap. XXIV of her memoirs. 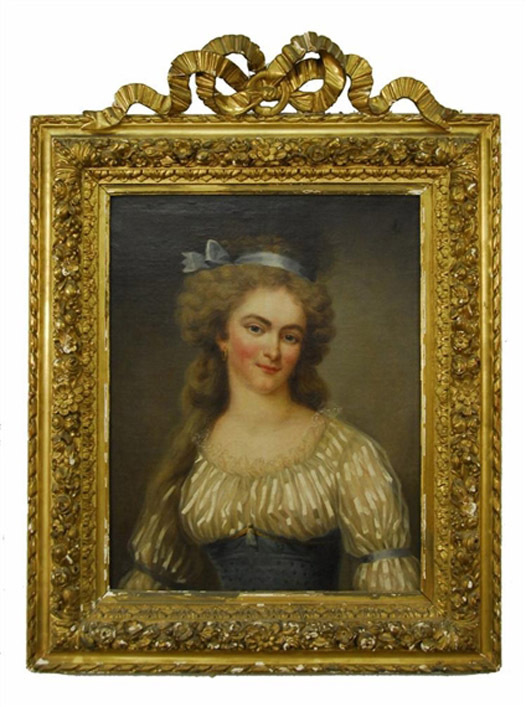 Angela Demutskiy identified a new painting that just came up for auction in NYC that is identified as the Princess Tufiakin portrait. See Art Page 61 for new details. The Princess de Lamballe was best friend of Marie Antoinette. She was born in 1749. 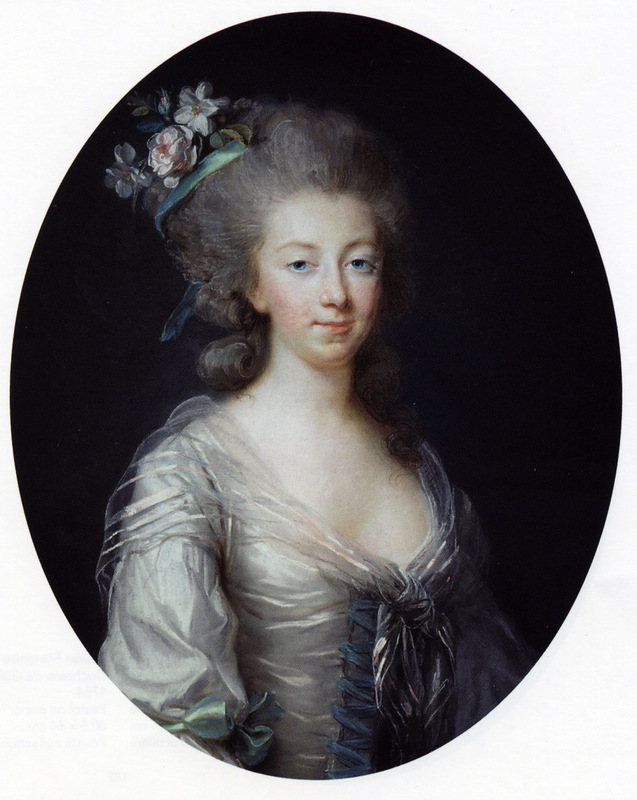 She was married to Louis Stanislas, the Prince de Lamballe (1747-68), the brother of Louise Marie Adélaïde de Penthièvre (the future Duchesse de Chartres). She was widowed at the age of 19. 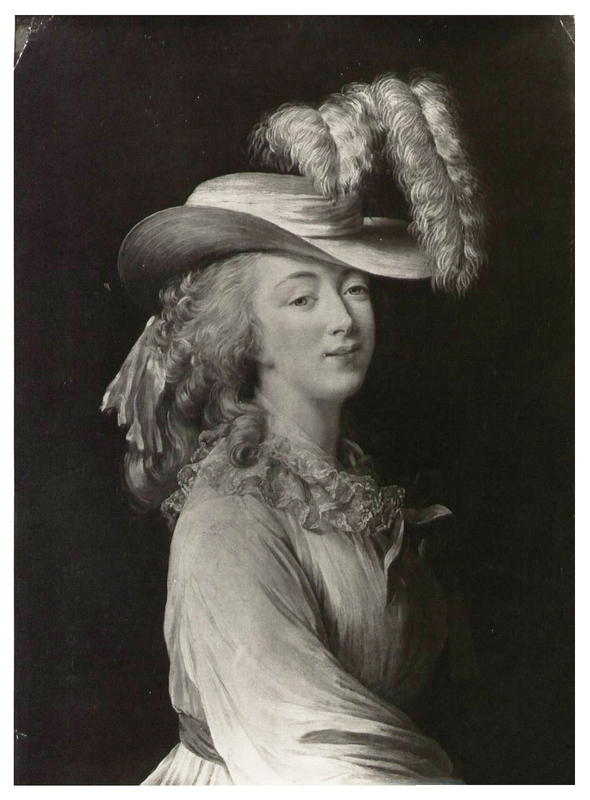 The Princess de Lamballe died on 3 Sept 1792 in Paris after she returned from England to help her queen. She was decapitated and her body was lacerated. Her head was mounted in a stick and put in front of the window of the temple where Marie Antoinette and the royal family were imprisoned. 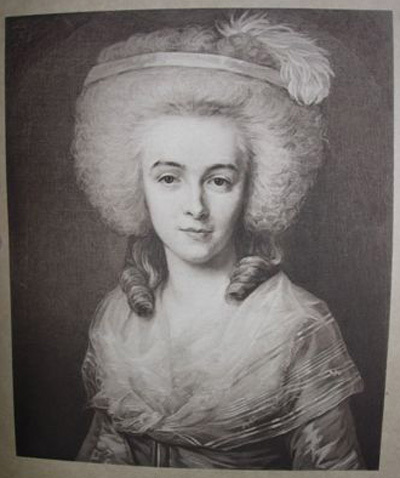 Another image of the Princess de Lamballe appears on art page 153 and art page 100 . View the 2011 sale information document. 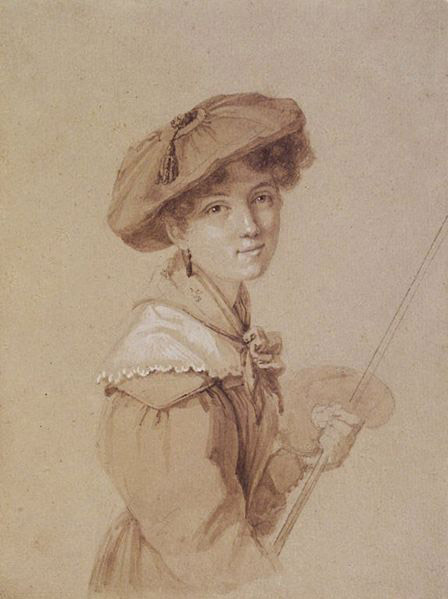 Copy by Vigée Le Brun of her self portrait in the Uffizi Gallery, Frorence on Art Page 6. 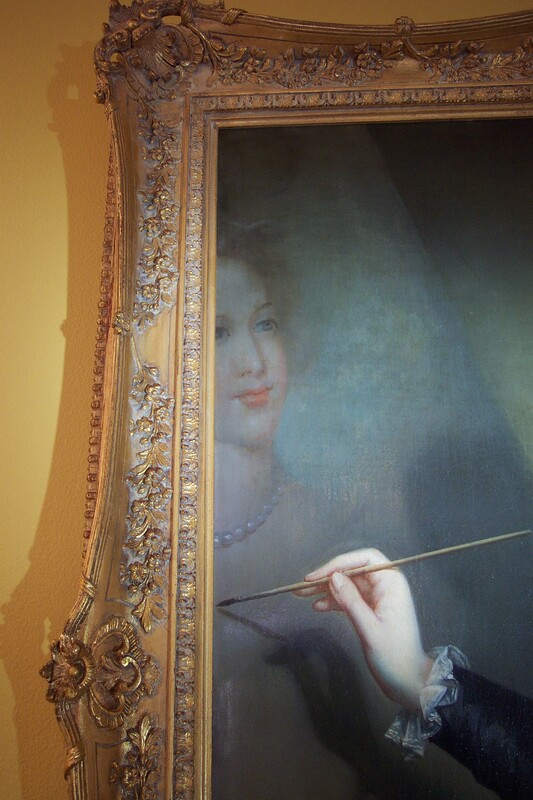 This paint is in the Watford Museum Collection, UK.. We did not know of this copy of the Uffizi self portrait. 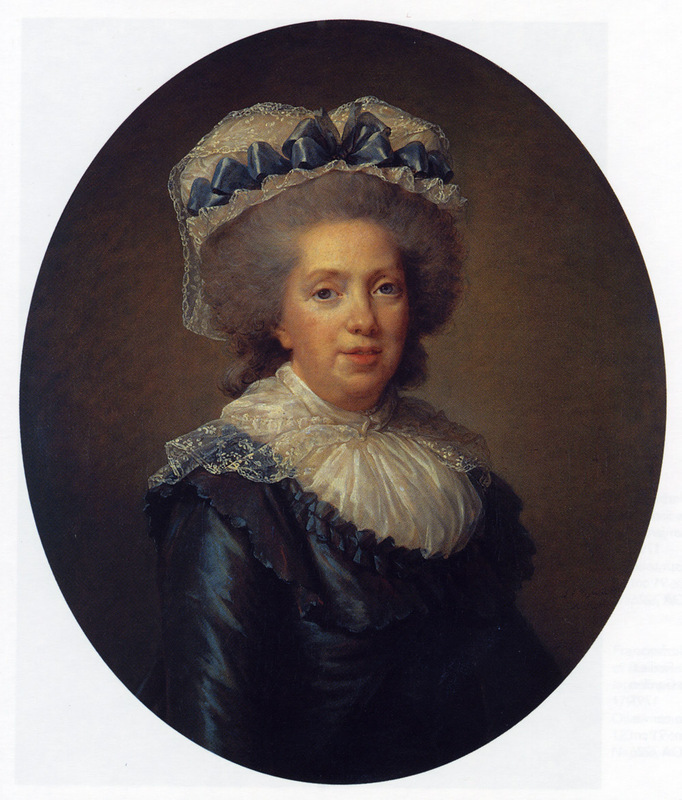 The other known copy ( with a different sitter) was painted for the Earl of Bristol by Vigée Le Brun (Art Page 6). Konopiste Castle, Czech Republic - ? 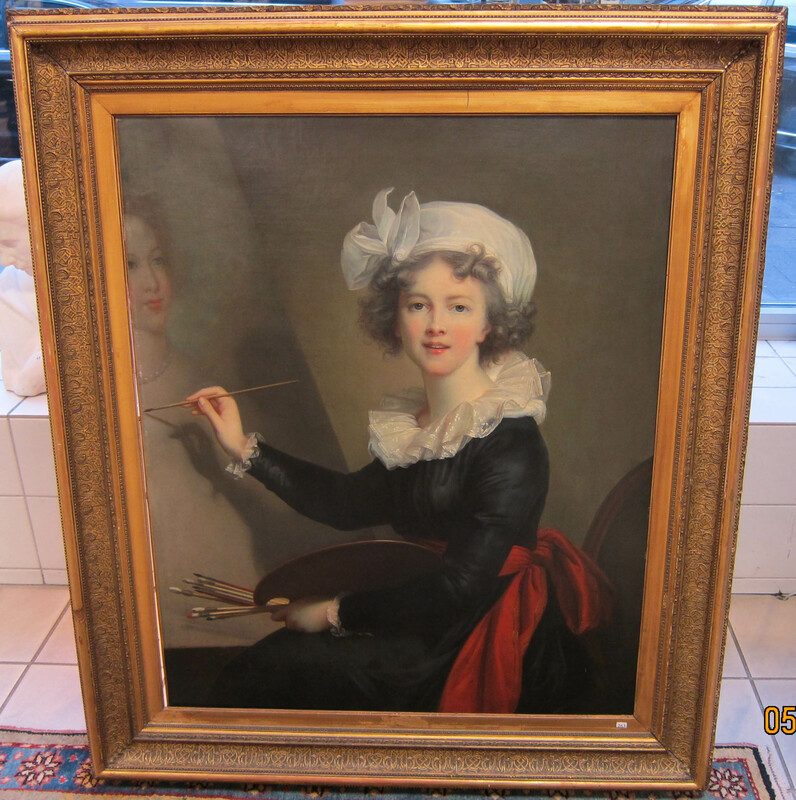 This painting is thought to be a copy by Vigée Le Brun of the portrait of the Queen on Art Page 31 that is in a private collection. The paintings are slightly different. Konopiste Castle is 50 km south east of Prague in the town of Konopiste. The castle was the home of Archduke Ferdinand, assassinated in Sarajevo at the onset of World War I. Daughter of Pierre Jean Baptiste Gerbier de Massilaye the famous Paris Lawyer. From Vigée Le Brun's Memoirs - "From the age of fifteen, I had been widely known in high society, I knew our first artists, so I was getting invitations from all sides. 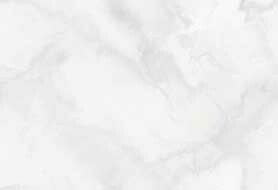 I remember very well that I had dinner in town for the first time at the sculptor Le Moine, then in high reputation. 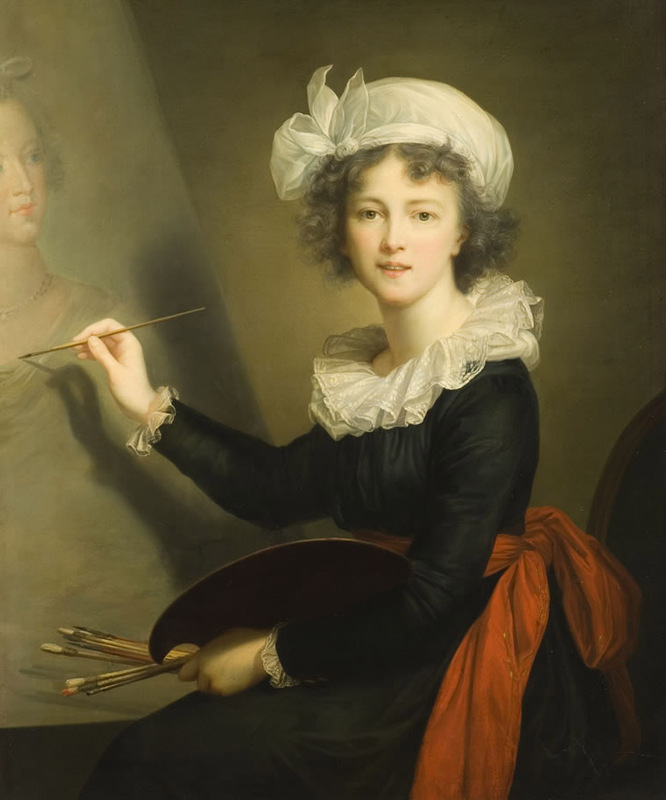 He was extremely simple, but had the good taste to bring home a host of famous and distinguished men. . . . From Le Moine, I met Gerbier, a famous lawyer, and his daughter, Mrs. Charles de Gaulle, who was very beautiful, and who was one of the first women whose portrait I painted." Offered for sale by Sotheby's in Paris on 22nd June 2010. 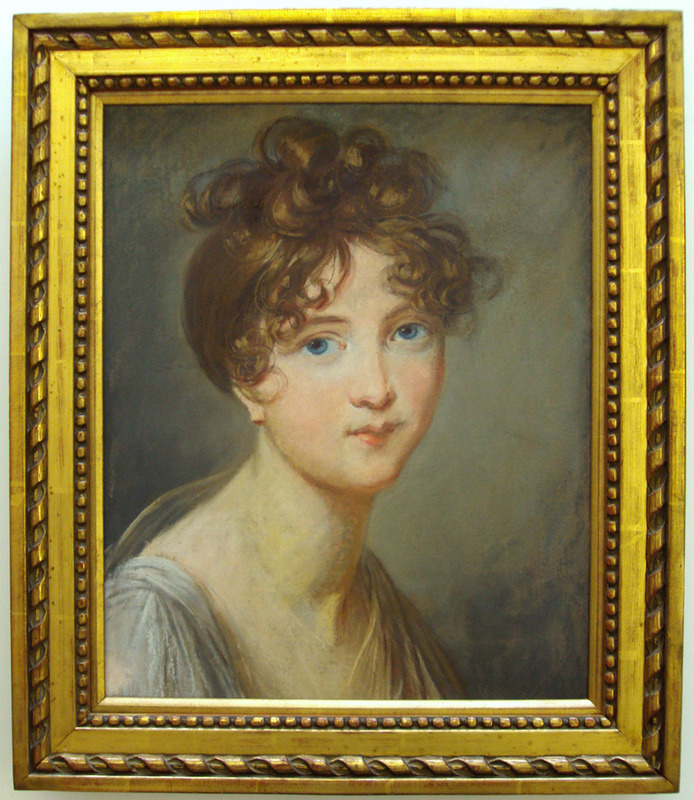 Vigée Le Brun listed two pastels of Queen Louise of Prussia (Berlin 1801). This one is in Castle Dunrobin near Golspie, Scotland. 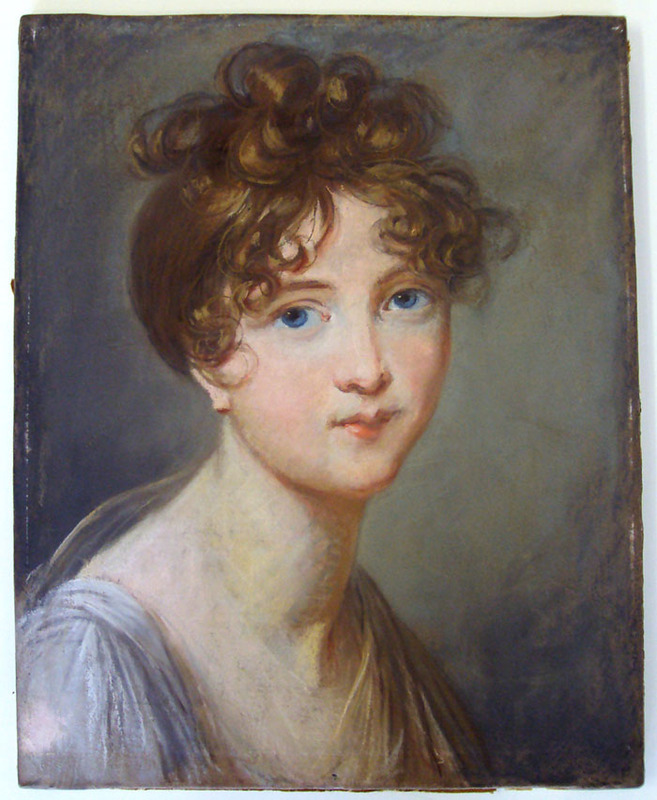 The pastel had been in the possession of George Granville Leveson-Gower, the later 2nd Earl of Sutherland (1786-1861). He was an ardent admirer of the Queen, having met her in Nov. 1806 at Konigsberg. View an engraving by another artist that seems to be after the castle Dunrobin pastel, though it was reversed and has a different costume. View the other 1801 pastel on Art Page 43 and the oil painted from that pastel on Art Page 56. 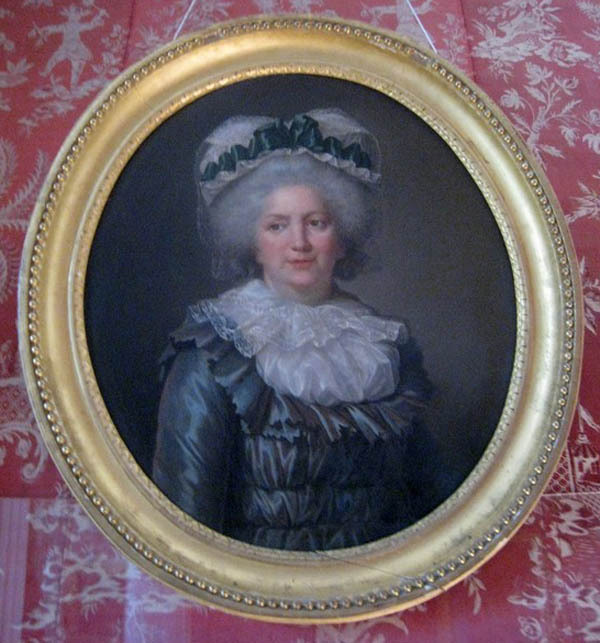 Visit the Queen Louise of Prussia page which has been updated with the new pastel from Jana. The story on this page, "My Beautiful Enemy" is my favorite history write ups on this web site. This Queen dared stand up to Napolean in this dangerous period of Europen history. Napolean was obviously captivated.